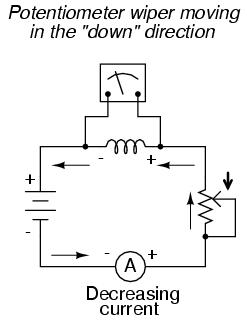 You should recognize the form of this equation from the capacitor chapter. 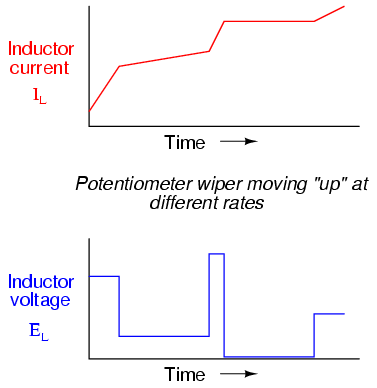 It relates one variable (in this case, inductor voltage drop) to a rate of change of another variable (in this case, inductor current). 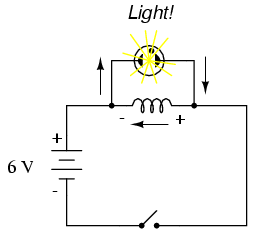 Both voltage (v) and rate of current change (di/dt) are instantaneous: that is, in relation to a specific point in time, thus the lower-case letters "v" and "i". As with the capacitor formula, it is convention to express instantaneous voltage as v rather than e, but using the latter designation would not be wrong. 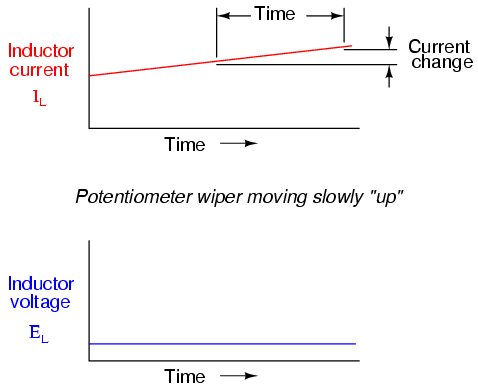 Current rate-of-change (di/dt) is expressed in units of amps per second, a positive number representing an increase and a negative number representing a decrease. Like a capacitor, an inductor's behavior is rooted in the variable of time. Aside from any resistance intrinsic to an inductor's wire coil (which we will assume is zero for the sake of this section), the voltage dropped across the terminals of an inductor is purely related to how quickly its current changes over time. 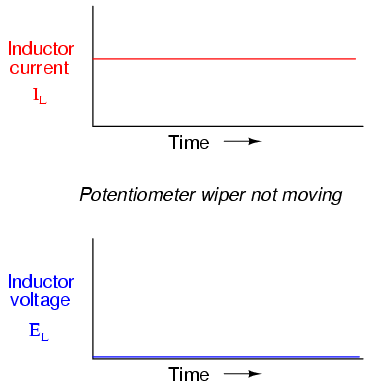 Assuming that the potentiometer wiper is being moved such that the rate of current increase through the inductor is steady, the di/dt term of the formula will be a fixed value. 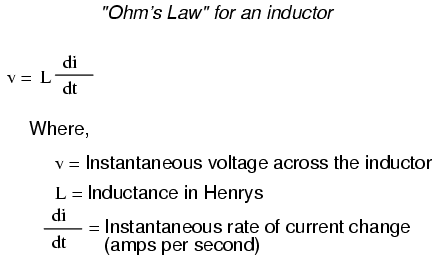 This fixed value, multiplied by the inductor's inductance in Henrys (also fixed), results in a fixed voltage of some magnitude. From a physical perspective, the gradual increase in current results in a magnetic field that is likewise increasing. This gradual increase in magnetic flux causes a voltage to be induced in the coil as expressed by Michael Faraday's induction equation e = N(dΦ/dt). 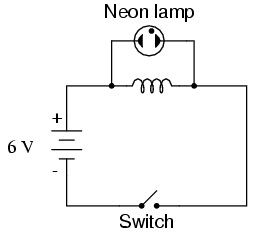 This self-induced voltage across the coil, as a result of a gradual change in current magnitude through the coil, happens to be of a polarity that attempts to oppose the change in current. In other words, the induced voltage polarity resulting from an increase in current will be oriented in such a way as to push against the direction of current, to try to keep the current at its former magnitude. This phenomenon exhibits a more general principle of physics known as Lenz's Law, which states that an induced effect will always be opposed to the cause producing it. Here again we see the derivative function of calculus exhibited in the behavior of an inductor. In calculus terms, we would say that the induced voltage across the inductor is the derivative of the current through the inductor: that is, proportional to the current's rate-of-change with respect to time. How much voltage the inductor will produce depends, of course, on how rapidly the current through it is decreased. 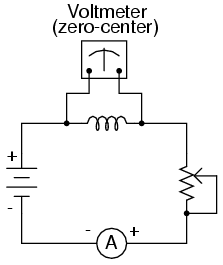 As described by Lenz's Law, the induced voltage will be opposed to the change in current. With a decreasing current, the voltage polarity will be oriented so as to try to keep the current at its former magnitude. 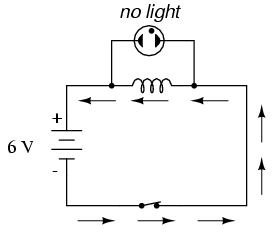 In this scenario, the inductor will be acting as a source, with the negative side of the induced voltage on the end where electrons are exiting, and the positive side of the induced voltage on the end where electrons are entering. 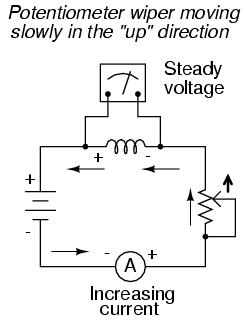 The more rapidly current is decreased, the more voltage will be produced by the inductor, in its release of stored energy to try to keep current constant.